Garlandium creator David Jacobs wants all to be informed of the Garland neighborhood's happenings. When it comes to neighborhood tour guides, you can't beat David Jacobs. The 57-year-old artist moved to North Hill three years ago, attracted by the close-knit community vibe, and particularly the artistic bent of Garland Avenue. "There's a certain magical thing about this neighborhood," Jacobs says. "Everyone knows everyone." As if to prove his point, an afternoon with Jacobs is an afternoon meeting local artists, residents and business folks who all seem to know each other — even the relatively new transplants to North Hill. There's Kay West, who opened Little Dog Art Gallery a couple of months back after moving to the North Hill home her sister's lived in 35 years. She appreciates the "strong sense of community" she found after years in Southern California. "Everybody has a dog," West says. "People are friendly." Next stop, Swede's Fly Shop, where owner Allen Peterson moved in June after 12 years on Ash Street. He echoes West, and jokes good-naturedly about the artsy side of the neighborhood. "It reminds me a little of the Fremont District in Seattle," Peterson says. "It's very eclectic. I call it the Haight-Ashbury of Spokane." As you walk with Jacobs, you just keep meeting people. Here's Erin Johnson, owner of Book Traders, which Jacobs considers the best neighborhood gossip spot. Out back, say hello to muralist Todd Benson, training a team who will help him with a new mural on Maple. Down the block, greet another new transplant, Josh Scott, who moved his Time Bomb Collectibles from Monroe Street to the North Hill because "there are a lot more people walking around looking for stuff to do." 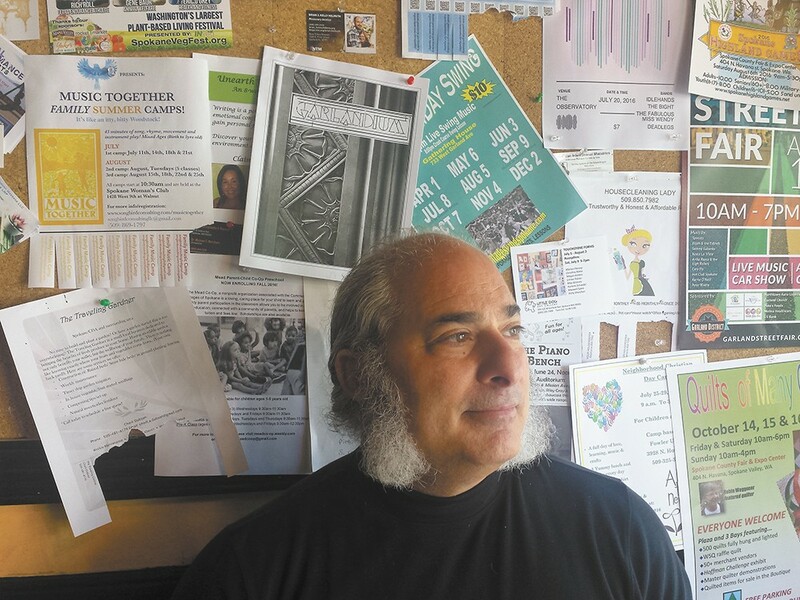 While Jacobs spends much of his time working on his art, he was inspired to start a neighborhood newsletter, Garlandium, by watching Julie Shepard-Hall, president of the Garland Business District and a one-woman gang who works tirelessly to promote the commercial district bisecting the North Hill neighborhood. "Once I saw what Julie was doing, getting everyone organized, I wanted to be involved," he says of the publication he designs, writes, takes pictures for and publishes each month. He sees Garlandium — which has grown from four pages its first issue in May to a planned 16 or 20 for August in time for the Garland Street Fair on Aug. 13 — as a way "just to try and unify the neighborhood." 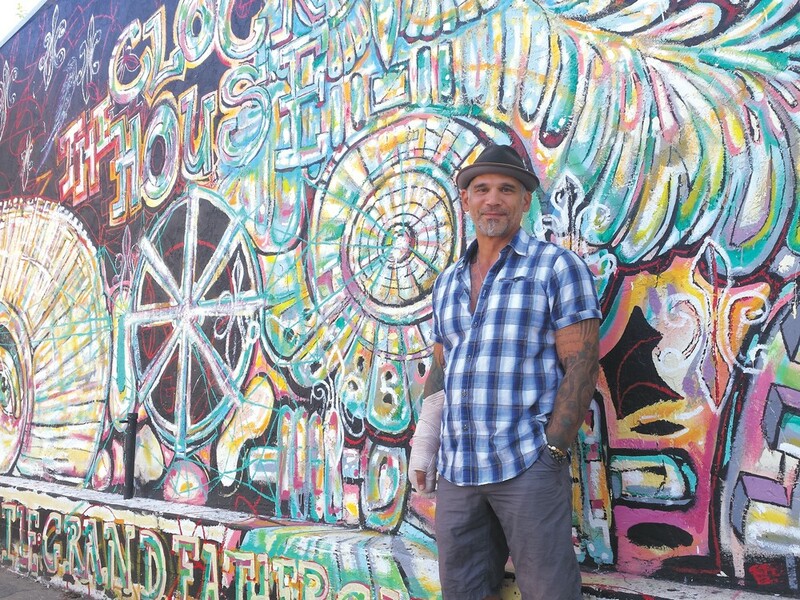 Muralist Nate O'Neill, with his work at the Clock House, sees North Hill as an arts haven. Nate O'Neill can't help but get a little misty-eyed when people take in his mural — still a work in progress, but colorful and engaging — on the Clock House on Garland Avenue. He lives nearby, and often gets to see people view his ornate creation. For O'Neill, the mural represents "a chance." It's a chance for him, personally, to grow as a painter, moving off canvases into large-scale public works, and to continue moving past trials that include a stint in prison for bank robbery. And it's a chance for his North Hill neighborhood to embrace its role as an arts haven, something that seems obvious when one considers the presence of several music stores, the Spokane Art School, new Little Dog Art Gallery, and murals inside and outside area businesses. "I want to affect, and hopefully infect, people in a positive way," O'Neill says, noting that he wants to create visual centerpieces that will draw people from other parts of town. "I want to bring something Spokane doesn't have yet. And I want people to acknowledge we're here." "Here" is the North Hill, home to about 5,000 homes built primarily between the early and mid-1900s. Bordered by major commercial streets on three sides — Division to the east, Francis to the north, Ash to the west — and the bluff that gives the neighborhood its name to the south, the neighborhood within its borders is dominated by single-family homes and apartments filled by young families as well as lifers. O'Neill is a proud North Hill resident who's lived in the area all his life — "I'm a Northside guy" — and his ideas for the neighborhood don't stop with his own art. He envisions a community where people come to watch movies on an outdoor screen, peruse local artists' booths in a mini-market, grow things in community gardens and enjoy music on the streets while dropping in on longtime businesses like Ferguson's Café, Bon Bon or the Brown Derby. While O'Neill is working to spark these ideas to reality, he's starting the process at home, converting his front yard into a rock garden he hopes becomes like Seattle's famed "gum wall," where locals drop rocks to create a colorful community landmark that will last well past the neighborhood's current incarnation. "I want to inspire others to see the neighborhood differently," he says. 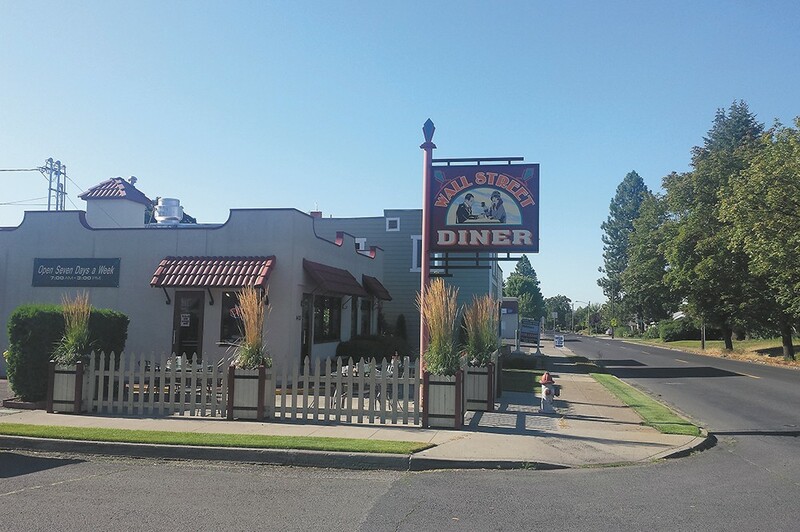 The Wall Street Diner is central hub of the neighborhood. The black-and-white photos started as simply a design idea to recall the classic eateries of yesteryear for owner Janice Maas when she bought the space on the corner of Wall Street and Princeton Avenue. Make it feel a little more "old-timey" even though she completely revamped the property inside and out 16 years ago, turning a longtime drive-in into the Wall Street Diner. Those photos were just one aspect of the retro-fueled decorating job, along with a soda fountain-style bar, Tiffany-style lamps on the booth tables and a soundtrack of oldies from the '50s and '60s. But a funny thing happened. As North Hill families became regulars, or rekindled relationships with the place they visited decades ago— it's been open nearly nonstop since 1947 — they started bringing in old shots of their own family members, adding them to the collection. What started as a decorating job meant to evoke a retro vibe has become a real part of the neighborhood's history. "I've met a lot of people through the years who went to the original place, and they've come back," Maas says. "It seems like a real family place. We have lots and lots of regulars." Established: In the early 1900s the earliest homes were built on southern end of North Hill, while the north end consists mostly of homes built from the 1940s through the '70s. Landmarks: Garland Milk Bottle (now Mary Lou's Milk Bottle restaurant), Franklin Park, Ferguson's Café, Garland Theater.